BicycleFriends.com: Knobby Time, "Back By Popular Demand!" 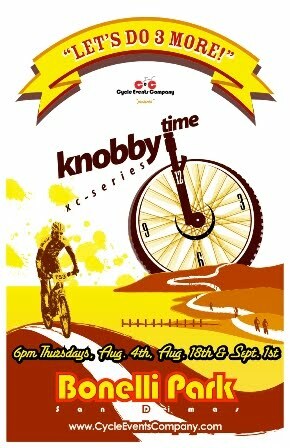 Knobby Time XC Series is coming back to Bonelli Park Aug 4, Aug 18 and Sept 1, 2011. The Knobby Time is a great mid-week racing series located at Bonelli Park. Bonelli can be easily accessed from the 60, 71, 210, and 10 FWY. I raced the last three in June and had a blast. I met some really cool people with a shared passion for fitness and cycling. I even met a fellow Blogger, The Claremont Cyclists. In June, I placed 4th, 5th and flatted on the third race resulting in a DNF. I want to at least get on the podium this time around!